"Got the time?" "Yeah, X-2, X-2 your own damn business!" 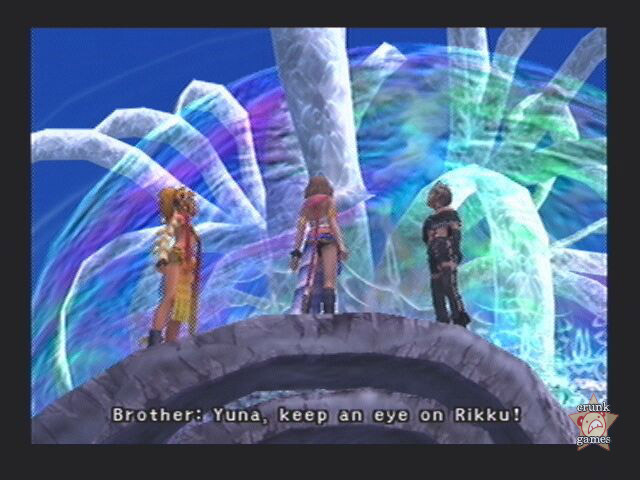 Yuna and friends form their own sphere hunting girl group to find answers in a seemingly always screwed up Spira. In the early decades of filmmaking, a sequel was something that just didn’t happen — if anything, movies were carried by the stars and starlets rather than the name. As the years moved on and Hollywood became more commercial, sequels became the norm, but not many sequels told stories in different settings, other than the occasional horror film. This was different with video games, and Final Fantasy in particular has always ran on independent tales that share little between them aside from medieval roots and chocobo riding. After twelve games and 16 years, who can blame them? The series would probably be long diluted if it carried on a singular soap opera-like progression. To the fans, however, some FFs beg for a direct sequel, and apparently Square has listened this time. After a year of speculation, surprise and 8 months between releases, finally we have Final Fantasy X-2, the first real sequel. Despite the fact it’s based on a 2 year-old game, nobody expected it to turn out quite like this, and that’s a good a reason as any why Square should be complemented. No, really. A spirited intro movie reintroduces us to the new, somewhat less dressed Yuna and the other female members of her sphere hunting gang the Gullwings: there’s Rikku of course, who wears even less, and a new punk-haired introvert named Paine. 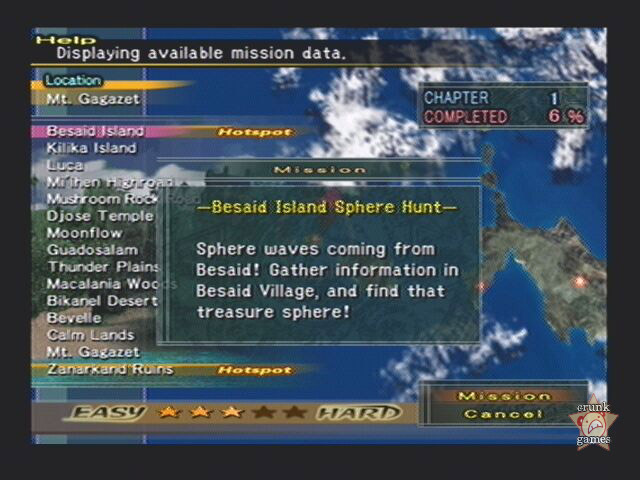 Sphere hunting is a popular thing to do in Spira in the two years since the Calm has come, though we never really know why. Regardless, it gives Yuna the chance to find out more about a sphere she found that contained what looked the image of her lost love Tidus. It sounds simple, but on the inside the story is much more. The mood of the game is frequently upbeat and comedic, but not as "girly" as early critics have suggested; yes, Yuna is much more outspoken and giggles along with Rikku, but she still has her goal and is optimistic — not mopey — about it, and the story is told as both a lighthearted and inspiring adventure. The game is broken up into five "chapters" (a sad localizational sacrifice of the Japanese version’s quirky "story levels"), and you’ll be taken through most of Spira once again as you complete special missions and trigger events in order to advance the story. You’re immediately free to travel to any location from FFX, from Besaid to the Moonflow to the Calm Lands. They still look as wonderfully detailed as before, as the graphics engine has held up remarkably well in two years’ time. Although it’s fun to revisit and see what’s happened to Spira lately, we really would have liked to see at least one new area outside of the endgame — mostly all that’s added to the existing areas are drab, repetitive dungeons. Plot-dependent missions are marked as Hotspots, patiently waiting for you to take them up, but will disappear by the end of the chapter. A largely non-linear game is new for the FF series, but X-2 handles it pretty well. 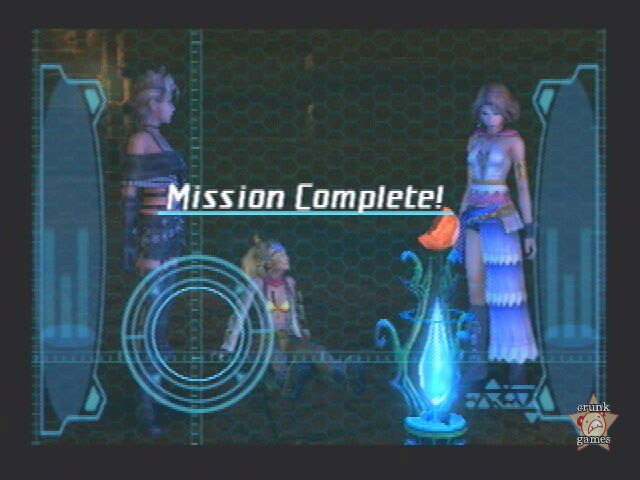 The main quest is about half as long as FFX, but the fact that there’s so many missions to pick up and three (well, two and a half) endings to see can extend the game far beyond its 20-plus hour projection. Besides, anyone expecting a saga out of what is basically a way to get back in black is just setting themselves up for disappointment. For those of us who dwell less on story and character, an FF game is defined more by the battle system attached to it, and X-2’s resurrection of ATB not only defines the game, but redeems it. It’s really what should have happened a few games ago: the system is still turn-based but rarely feels like it, being sped up considerably so as to blur the wait times between player and enemy. You can still set it to Wait" but surprisingly it doesn’t slow down the action much. On top of this, there are no defined rows, so each battle is a big messy melee. That’s good! This results in a believable and actually enjoyable experience each time you head into a fight. And we haven’t even mentioned the job changing, powered by numerous dresspheres that the girls can find and earn through the game. By hitting L1 at any time during a battle, you can change into a new job and outfit, which instantly modifies your stats and gives you a whole new set of commands, all right in front of you. Again, it’s amazingly swift, but with powerhouse jobs like Warrior and Black Mage available early on, sometimes all you need is to stick with the same combination of jobs and your ability to hold down X and you can plow through many enemies that aren’t bosses. On the other hand, it pays to have everyone build up the jobs evenly, and with a number of extra (and exponentially goofier) dresspheres to earn, you’ll be doing it a lot. You may also be switching Garment Grids a lot, which are like simplified sphere grids that dresspheres are placed into. Many of them contain icons that offer temporary status boosts that can only be activated when passed over. For example, if you have a Gunner sphere adjacent to a Samurai sphere, and between them is a 10% defense boost, you’ll only get the boost once you switch to the other job. Like dresspheres, there’s lots of them to be had throughout the game, though luckily they’re not always as hard to obtain. The other big shift in X-2 is the music. Nobuo Uematsu has sat this one out entirely and left the soundtrack in the hands of Noriko Matsueda and Takahito Eguchi, who also produced the music in The Bouncer, though try not to hold that against them. As you may remember from FFX, the addition of Junya Nakano and Masashi Hamauzu resulted in a few tracks that veered from the "Uematsu norm" ever so slightly. In X-2, Matsueda and Eguchi have essentially made an entire game’s worth of these diverse tracks and then some. Many of the tunes keep with the theme of the game, presenting upbeat, rocking, sometimes saccarhine compositions, but with an equal amount of dramatic and soothing pieces as well. In some cases, new music in familiar locations like Luca isn’t too different, keeping the spirit of the originals alive. It all fits the game’s story and content perfectly, and if your mind is still open, you’ll enjoy it. With the quicker pace of the game, there’s not as much music to go around this time — X’s OST came on 4 CDs, X-2’s is on a scant 2 — but this results in a more consistent and listenable set of music as good as any Square production. Another aspect of the audio (and historically the most contested) is the voice acting. 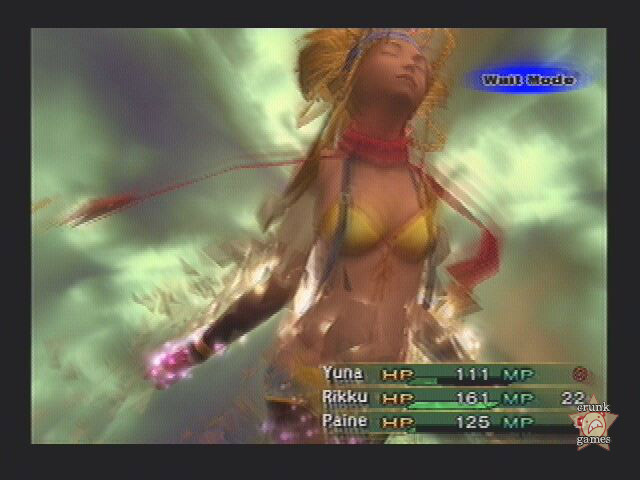 Basically, FFX-2 is as well-acted as the original, perhaps even better. The problem is that while the lines themselves are read well, there are still occasional delays between them, which do a fantastic job of throwing you out of the moment as you wait patiently for someone to say something. But when someone does, it’s not awful. Hedy Burress returns as Yuna and does a wonderful job adapting to the changes in the character, moving from a soft-spoken summoner to a much more open yet still thoughtful sphere hunter. 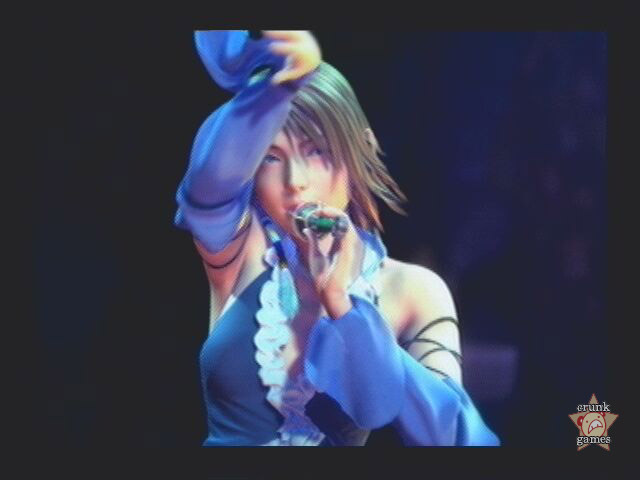 She convinces you that this is how Yuna is supposed to sound like, which can also be said of Rikku and Paine. The in-battle chatter that enhanced the last game is back too, and Rikku seems to have been the one chosen to dole out the irreverence; you may even catch her slyly referencing another game at some point.